Salted caramel sauce is practically a staple in my house come Fall. It can go on everything! Slather it on some apple slices, drizzle it on a cake or cupcake, even toss it into your apple pies! It probably seems like one of those things that is easier to buy at the store than to make at home, but I assure you, it is not. Caramel sauce is so easy to make at home and takes minutes. Plus, it just tastes so much better when there are fewer, simpler ingredients involved. Speaking of ingredients, there really aren't very many ingredients involved in a good caramel sauce. Just sugar, water, cream, and butter. Of course, this is salted caramel sauce, so sea salt is also necessary. To make the sauce, first, bring granulated and sugar to a boil. Continue to boil until it turns an amber color. Do not stir this mixture at all, otherwise sugar crystals will form inside the sauce. Once it's a rich amber color, pour in warm heavy cream. Do this slowly because the mixture will start to bubble up and you don't want it breaching the walls of your sauce pan. After the cream has settled down, turn the heat to low (or off) and add in the butter. Stir the butter into the caramel until it's completely melted. Once the caramel has cooled a bit, stir in the sea salt. You don't need a lot to add a salty punch to the sauce. And if you ever want more salt in your salted caramel then you can just sprinkle more on top. In a small to medium sauce pan, add sugar and water and stir to combine. Place over medium high heat to bring to a simmer. Continue to let the mixture simmer or boil for 5-7 minutes. Do not stir the mixture, but if sugar crystals form along the sides of the pan, use a wet pastry brush to wet the sides. 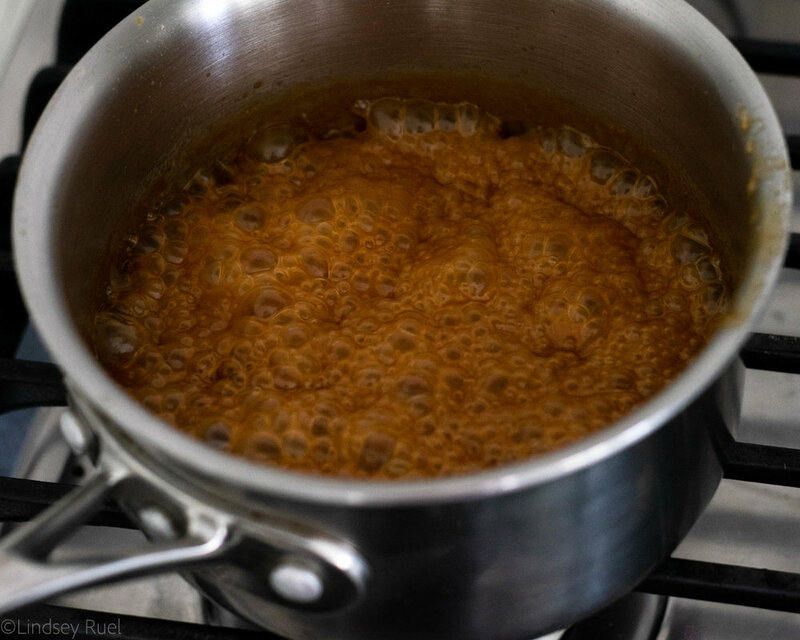 Once the sugar has turned a rich amber color, reduce heat to low and slowly pour in the warm cream. After the mixture is no longer heavily bubbling, stir in the butter. 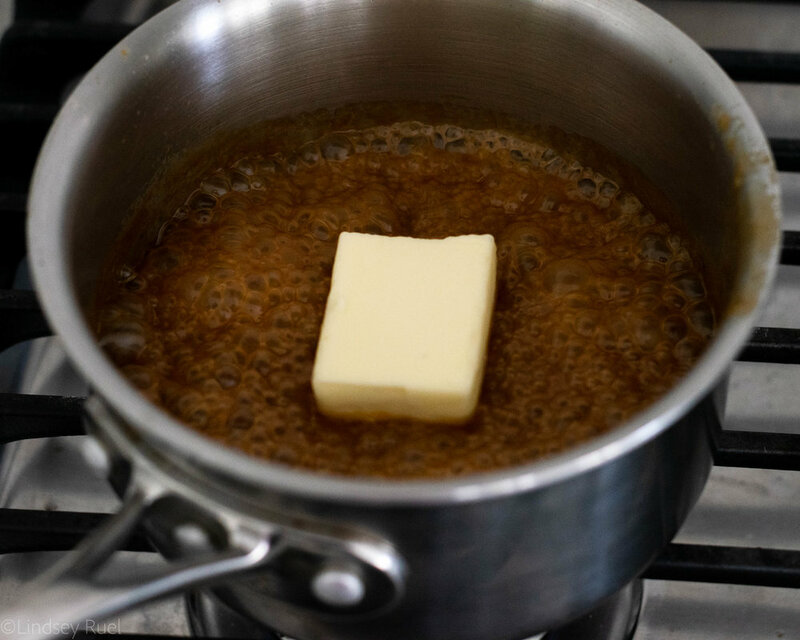 Before all the butter is incorporated, remove from heat and let the heat from the caramel melt the remaining butter. Let cool for 5-10 minutes then stir in sea salt. Transfer to a clean jar or container. Store in an airtight container for up to 2 weeks in the fridge.